About this objectA black and white photograph of five World War One soldiers. We can identify two of the men who had local connections. 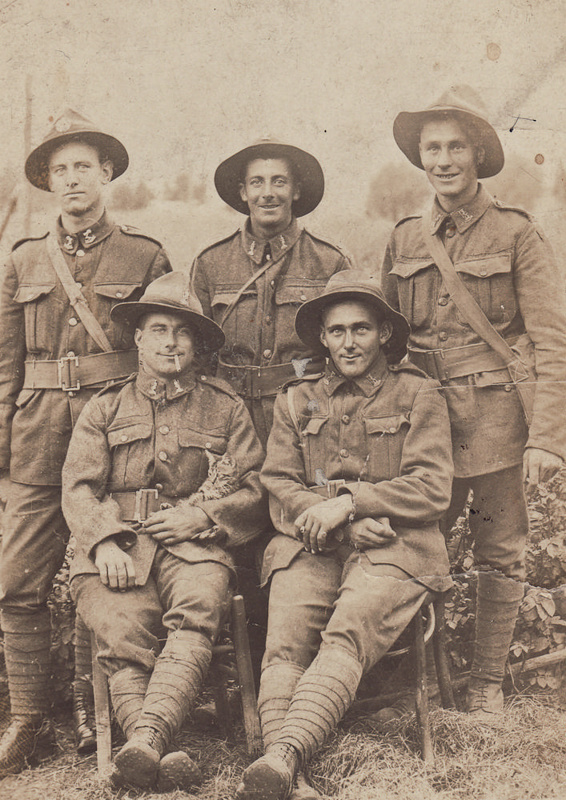 Rifleman Harold Prattley (29940) is back far right and Rifleman Alfred Arthur Turner (29952) is front far right. The photograph is formatted as a postcard and is from Harold Prattley to a friend called Alex (we can't tell who Alex is). Harold was a farrier who lived in Gore before enlisting in June 1916. He become medically unfit for service and returned home in May 1918. Harold went on to live a long life, passing away on 15 September 1967 aged 72. Alf Turner was raised in Mataura and worked at the Mataura Freezing Works prior to enlisting in June 1916. He was wounded in the face and neck in October 1917 but survived and served out the rest of the War before returning home in May and June 1919. Alf returned home and recommenced work at the Freezing Works as a solo butcher, we have several photographs of him at work in the 1920s and 1930s. Alf died on 21 August 1961 aged 64.
Credit LineFrom the collection of the Mataura and Districts Historical Society Incorporated.